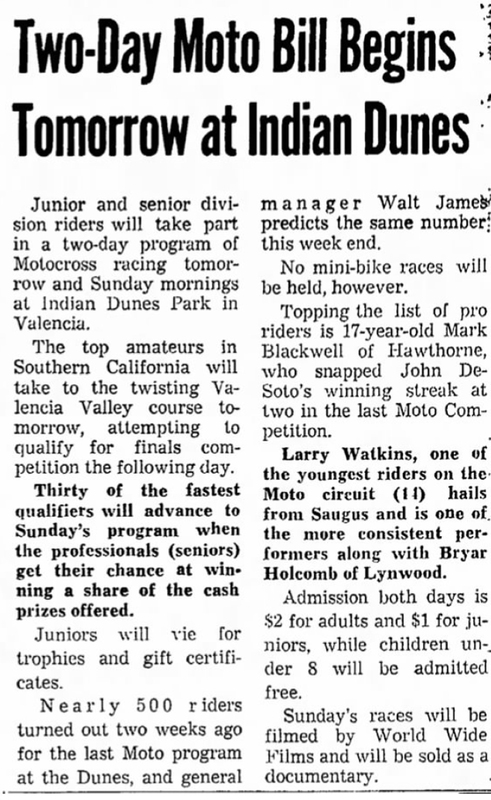 SCVHistory.com | Valencia | Larry Watkins of Saugus in 2-day Motocross Competition at Indian Dunes, Jan. 1971. 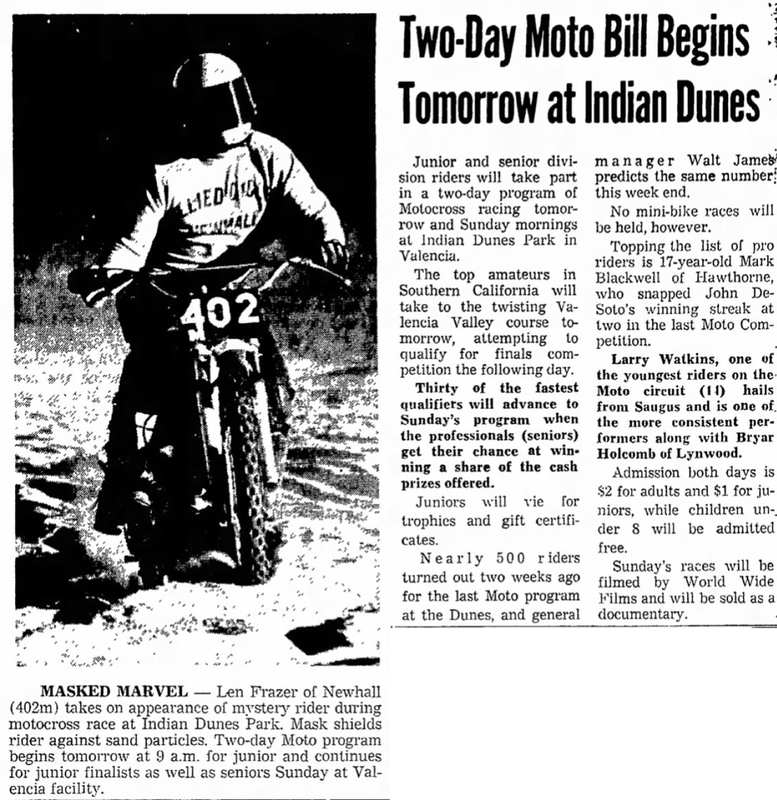 Two-Day Moto Bill Begins Tomorrow at Indian Dunes. Valley News | Friday, January 29, 1971. Junior and senior division riders will take part in a two-day program of Motocross racing tomorrow and Sunday mornings at Indian Dunes Park in Valencia. The top amateurs in Southern California will take to the twisting Valencia Valley course tomorrow, attempting to qualify for finals competition the following day. Thirty of the fastest qualifiers will advance to Sunday's program when the professionals (seniors) get their chance at winning a share of the cash prizes offered. Juniors will vie for trophies and gift certificates. Nearly 500 riders turned out two weeks ago for the last Moto program at the Dunes, and general manager Walt James predicts the same number this weekend. No mini-bike races will be held, however. Topping the list of pro riders is 17-year-old Mark Blackwell of Hawthorne, who snapped John DeSoto's winning streak at two in the last Moto Competition. Larry Watkins, one of the youngest riders on the Moto circuit (11), hails from Saugus and is one of the more consistent performers along with Bryar Holcomb of Lynwood. Admission both days is $2 for adults and $1 for juniors, while children under 8 will be admitted free. Sunday's races will be filmed by World wide Films and will be sold as a documentary. News story courtesy of Sharon Divis.